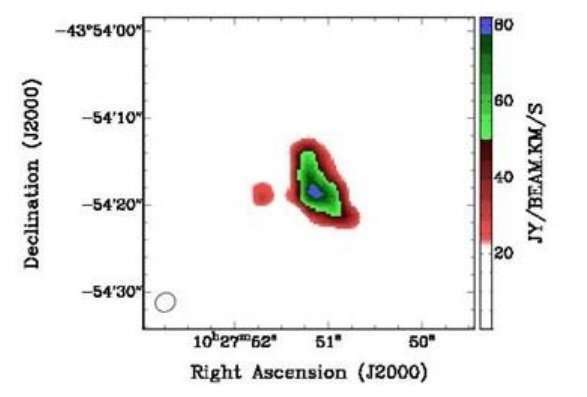 Integrated intensity (mom0) map of the CO(1-0) line emission in the central region of NGC 3256. Credit: Ali et al., 2018. A new research recently carried out by astronomers suggests that the galaxy NGC 3256 has substantial amounts of dark matter in its central region. The finding, presented in a paper published October 2 on arXiv.org, might pose a challenge to the modified Newtonian dynamics theory. Located some 114 million light years away in the Hydra-Centaurus supercluster complex, NGC 3256 is a luminous infrared galaxy (LIRG). It is one of the brightest nearby galaxies and the most luminous galaxy in infrared located within redshift of 0.01 from the Earth. NGC 3256 was formed as a result of a merger of two gas-rich disk galaxies and has a nearly face-on orientation. Such properties make it an excellent target for studying dark matter in LIRGs. Given that LIRGs like NGC 3256 are usually merging galaxies regulated by dark-matter halo merging, astronomers try to determine if a significant amount of dark matter can be identified in central regions of such galaxies, whose dynamical masses usually seem to be dominated by molecular masses. With this aim in mind, a team of researchers led by Israa Abdulqasim Mohammed Ali of the University of Malaya in Kuala Lumpur, Malaysia, has recently studied NGC 3256 using data from the Atacama Large Millimeter and sub-millimeter Array (ALMA) and the Two Micron All Sky Survey (2MASS). "We investigated the central mass distribution of the luminous infrared galaxy NGC 3256 at a distance of 35 Mpc by using CO(1-0) observations of the Atacama Large Millimeter and sub-millimeter Array (ALMA) and near-IR data of the Two Micron Sky Survey (2MASS)," the scientists wrote in the paper. The analysis of the available data allowed the team to determine the mass distribution in NGC 3256. They found that there is a significant amount of invisible dynamical mass (around 48 billion solar masses) in the central region of the galaxy. The fraction of the invisible mass was calculated to be about 87 percent of the dynamical mass. According to the authors of the paper, such huge amount of invisible mass, cannot be explained by the molecular mass and the stellar mass within the central region. Therefore, they suggest that invisible mass is likely caused by dark matter. "The amount of dark matter is about 4.84 ± 0.42 × 1010 solar masses, which is significantly larger than the stellar mass. It is clear that even the velocity was not circular, the dynamical mass that would be required to account for the observed velocity dispersion is still much larger than the baryonic mass, and thus the existence of a huge amount of dark matter in the central region of the galaxy is necessary," the researchers concluded. Dark matter in central regions of galaxies is still relatively unexplored. Astronomers generally agree that dark matter usually dominates in the outer regions of galaxies but is not considered as an important mass component in the innermost regions of galaxies. Hence, the authors of the study noted that their discovery might have a significant impact on modified Newtonian dynamics theory, which was proposed to explain the "missing mass problem" without using dark matter. "What is more important is that this missing mass problem cannot be explained with the traditional MOND [modified Newtonian dynamics] theory because of strong acceleration in the central region of the galaxy. Since most of the dark matter phenomena at galactic scales can usually be explained by the MOND theory very well, this discovery thus poses a significant challenge to the traditional MOND models," the paper reads.